It is a tradition in jazz to call up and coming stars of jazz “young lions” and on Saturday February 10th you will have a chance to meet the young lions of our community. It is the Reno Jazz Orchestra’s annual Jazz in the Schools, a full day of student jazz performances. 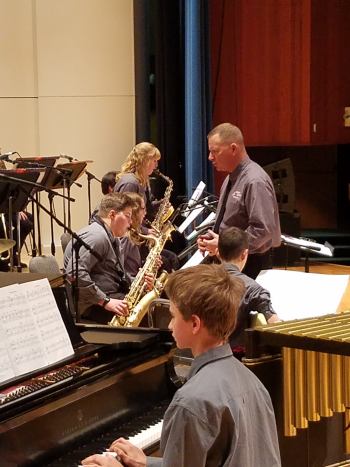 A record eighteen middle and high school jazz bands will perform in UNR’s Nightingale Hall starting at 8:30 AM and ending at 5:00 PM. After they perform, each band moves to the UNR Band Room to receive feedback from three of the top jazz clinicians in the country: Paul Harshman, Mike McMullen, and Steve Zenz. That, in itself, is a full day, but there is much more. Small combos from Damonte Ranch, Truckee, and Incline Village high schools will perform in CFA 112 and receive feedback from the UNR jazz faculty. Lunchtime, 11:30-12:30, the RJO and guest artist Bobby Shew will hold an open rehearsal to acquaint students with Bobby, a true legend of big band jazz. Sunday February 11th at 2PM the RJO will perform a concert with Bobby and all the students participating in Jazz in the Schools will receive a free ticket for that concert. The rest of us have to pay! But wait there is more. This year we are continuing our three-day class, begun last year, for Washoe County School District teachers to learn more about teaching jazz from the UNR jazz faculty. Why is the RJO so committed to this event? The answer is simple. Jazz is joyous and we want to share that joy. Think of jazz founding father Louis Armstrong. He set the standard that lives on today. Of course, jazz imparts all the human emotions, but if there is one word to describe jazz I can’t think of a better one than joyous. The RJO wants to introduce our students to jazz and encourage them to learn it, love it, and create their own brand of jazz. That is how jazz stays vibrant and alive. Such folks as Brian Landrus and Sam Minae were “young lions” who grew up here and have moved on to very successful jazz careers. I know there are students performing Saturday that will become just as successful as Sam and Brian. This, to me, is quite exciting. It is so wonderful to hear these student ensembles perform and hear them grow from year to year. Jazz in the School has grown over the years. In, fact we started it in 2000 with only a school or two and is now up to eighteen. How did that happen? Well it takes a champion to grow a program that significantly and the RJO’s champion is Dr. Andy Heglund, UNR Associate Professor and Jazz in the Schools Director. Assisted by Nina Wine, our education program coordinator, they have organized a great event. Thanks! 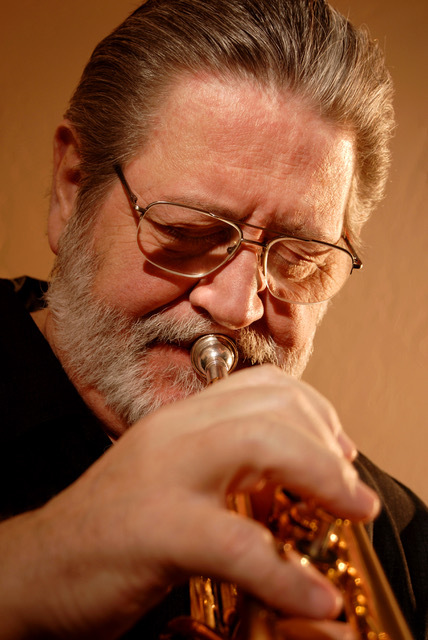 Bobby Shew is a true jazz legend and here is why. Like most musicians he got his start in school and at the age of twelve played his first dance gig where he discovered improvisation. The love affair with jazz started there and has become the driving force in Bobby’s life. After high school he spent summers in New York City listening to the masters and attended the first two Stan Kenton Summer Jazz Clinics. At the clinics he met jazz greats such as Shelly Manne, Conte Candoli, and Johnny Richards. After those experiences there was no turning back! Drafted into the Army, he became a featured jazz soloist in the NORAD band. After that came stints with some of the greatest big bands of all time. Woody Herman, Maynard Ferguson, and Benny Goodman just to name a few. He settled in Las Vegas for seven years playing in the top show bands and touring as lead trumpet for Elvis Presley, Barbara Streisand, Paul Anka, and Robert Goulet! Wow, that is a full career right there, but he decided to move to Los Angeles in 1972. There he became a first-call studio musician and continued to play in the great LA big bands of Bill Holman, Bob Florence, and Bill Berry. He also played in numerous combos like Horace Silver, Art Pepper, his own quintet and is a three-time Grammy Nominee. Bobby’s passion for jazz does not end with performances. He is a dedicated educator as well. He has authored several trumpet studies, taught at Cal State Northridge and the California Institute of the Arts. He is the former chairman for both the International Association of Jazz Educators (sixteen years) and International Trumpet Guild. In 2014 he was awarded the Lifetime Achievement Award for Performance and Education from the International Trumpet Guild as well as the Lifetime Jazz Legend Award from the Jazz Educators Network. A jazz icon and jazz legend? You bet, and I hope you can come see and hear Bobby to experience legendary jazz. None of this would be possible without our sponsors as there is no cost to either the students or the schools to participate in Jazz in the Schools. UNR has been a generous host allowing the RJO to hold the event in the Church Fine Arts Building.